July 31, 2008  Switzerland's health care system could be the perfect political compromise for the U.S. Those who can afford to buy insurance are required to do so by law. For those who can't, the government provides subsidies. Swiss citizens, such as Cecile Crettol-Rappaz, say they wouldn't trade it for any other system. July 28, 2008  The Navajo Nation Council has approved a ban on cigarettes and chewing tobacco in public places across its reservation, which spans Arizona, Utah and New Mexico. The tribe's president has 10 days to either veto or sign the ban into law. July 28, 2008  In a survey of people in Florida and Ohio, about half of the people polled reported they'd gone to work while sick during the past year because they feared the financial consequences of staying home. 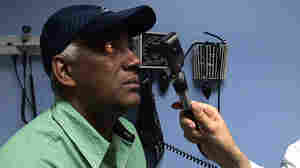 July 26, 2008  About 3 percent of people in the U.S. suffer from amblyopia, or "lazy eye" as it is more commonly known. People with the condition can see out of both eyes, but one eye dominates and the eyes may not work together. Now a team of scientists in Canada has shown that magnetic pulses to the brain may help restore abilities to the weaker eye. July 25, 2008  When 89-year-old Jack Tagg began losing his vision, Britain's National Health Service told him he would have to go blind in one eye before it would pay for treatment. In a public campaign, the World War II pilot took on the government — and won. July 24, 2008  Retail-based health clinics are expanding rapidly across the country. Most are located near the prescription counter inside large groceries. There are reports that two large Massachusetts health insurance companies will soon be paying for visits to these clinics. July 24, 2008  In Almost three years after Hurricane Katrina, people are moving back to St. Bernard Parish, La. Some, however, are starting to relive the storm's horrors. One group that has helped them is starting a mental health program. July 24, 2008  After he was diagnosed with multiple sclerosis, Jeff Rubin of Philadelphia went bankrupt paying for his medical bills. Would that happen in England? Both the U.S. and the U.K. ration health care. A look at patient experiences on either side of the Atlantic. July 23, 2008  Many middle-class Americans with jobs and health insurance have trouble paying their medical bills, according to a new survey. For one couple in Florida, that means putting off dental work. And a woman in Ohio shelved her doctor's request for more medical tests. July 23, 2008  If elected, John McCain has said he would appoint Supreme Court justices who would overturn Roe v. Wade. Barack Obama supports abortion rights but has said he's open to restrictions on late abortions. July 23, 2008  Tarceva has been shown to extend life in some lung cancer patients by an average of eight weeks. But Great Britain's government health service has decided not to provide the drug. Cancer patient Donald Sutherland and his doctor, Fergus Macbeth, explain how they live with that decision.